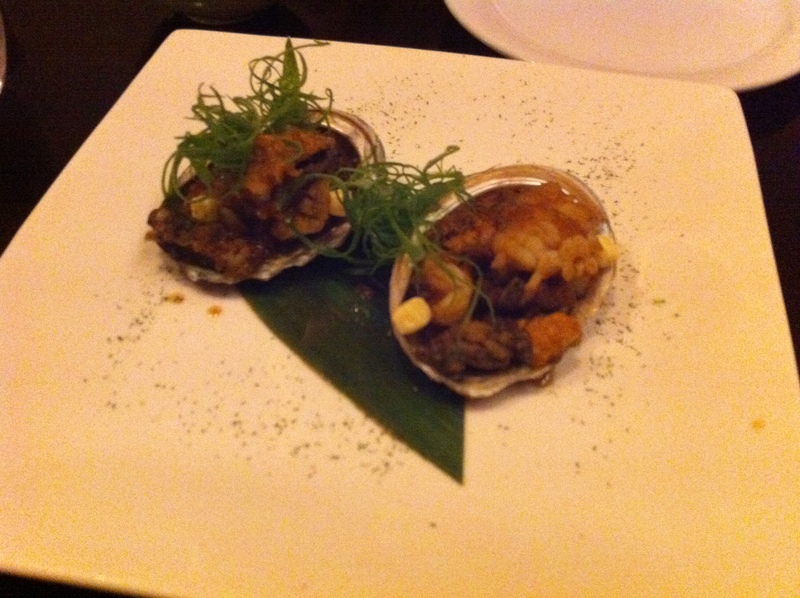 Shoya – an old favourite that consistently delivers! | 15,000kms of Food! 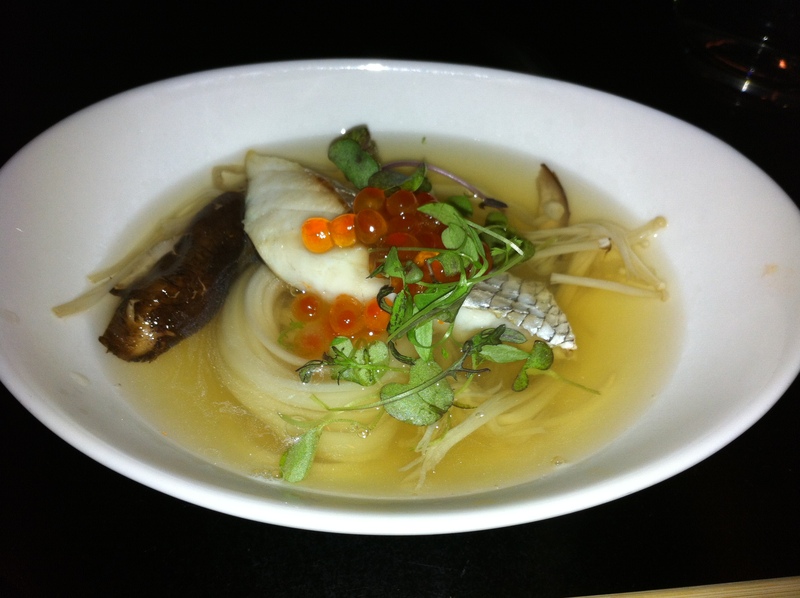 Shoya – an old favourite that consistently delivers! My beloved boyfriend brought me here for our anniversary in late Jan, as I love Shoya and have not been in 2-3 years. My oh my, how things do not change! This was a good thing, as the dishes I wanted were served to me as I had remembered. The restaurant was quaint, service was impeccable and food was delicious! We decided to go for the most modest of the degustations ($120 per person) and I’m honestly not sure how we would have coped with the larger ones as I was so fully by the end of it! 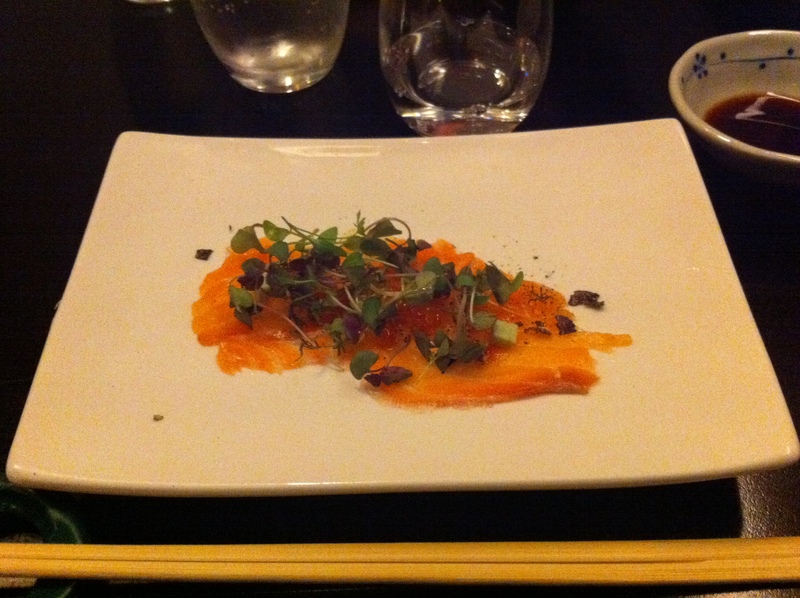 The first dish for the degustation was a lovely “Salmon Carpaccio Shoya Style“ served with deep fried salmon skin and truffle . We were instructed to roll it and eat in one mouthful. Delicious! The next item was “Kingyo” which is basically chicken meatballs. The meatballs smelled divine (chicken and sesame oil) and were a lovely soft consistency. It was served with lentils which added a nice texture. 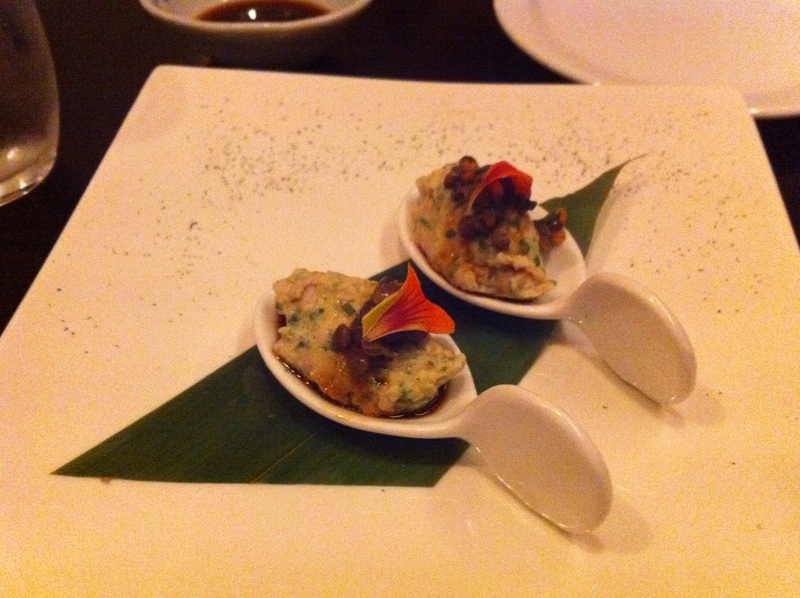 Next up was “Monk Awabi” which was an abalone dish served with monkfish liver pieces and miso flavoured cream cheese. It was tasty and my partner commented “who would have thought monkfish liver would taste that good”. 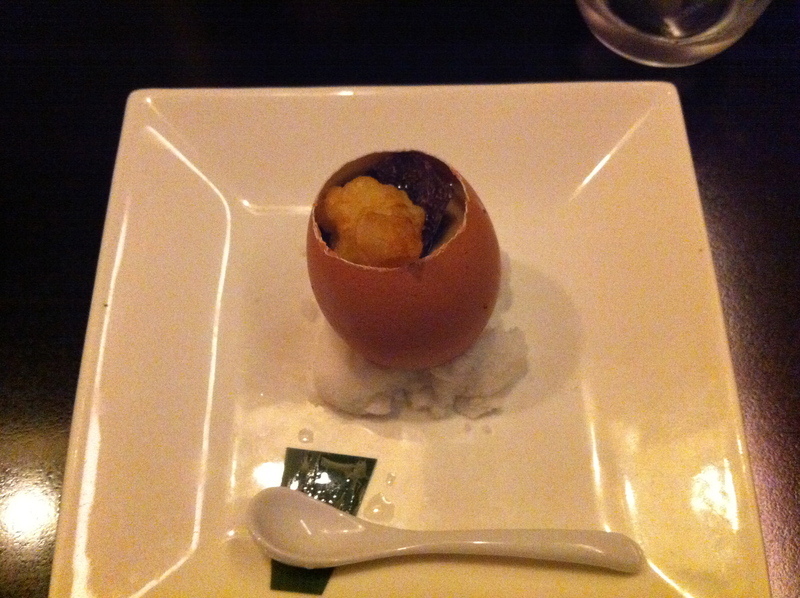 We were then served a mysterious sounding dish: “Hatching Ocean Egg“. It was a steamed egg custard (served in an egg shell) topped with truffle and tempura scampi (nom!). Beautiful flavours in a beautifully presented dish. 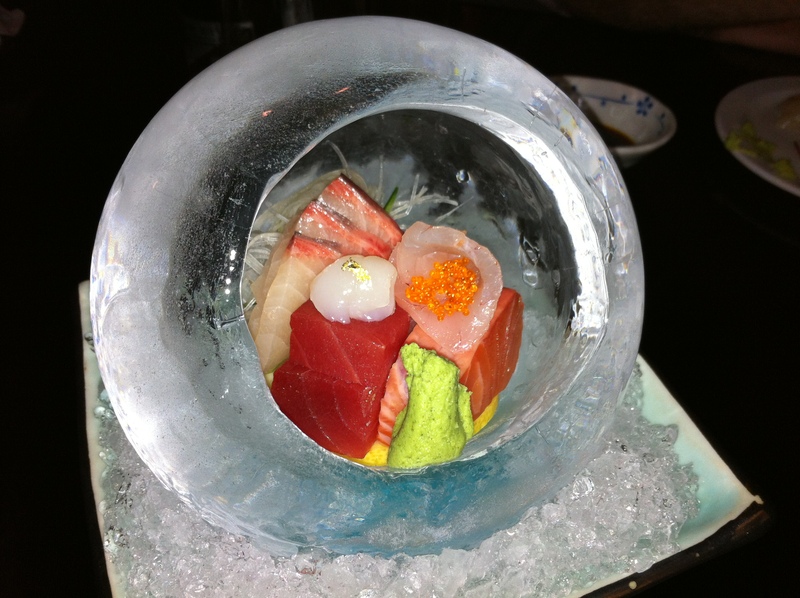 The “Assortment of Sashimi” has the most delicate and fresh sashimi presented in a mesmerising ice bowl. Mesmerising because my partner and I spent a good 10 minutes trying to work out how it was created (balloons?). Fresh wasabi was ground in front of us, and it made for a spectacular way to eat sashimi. On to the meat dish! 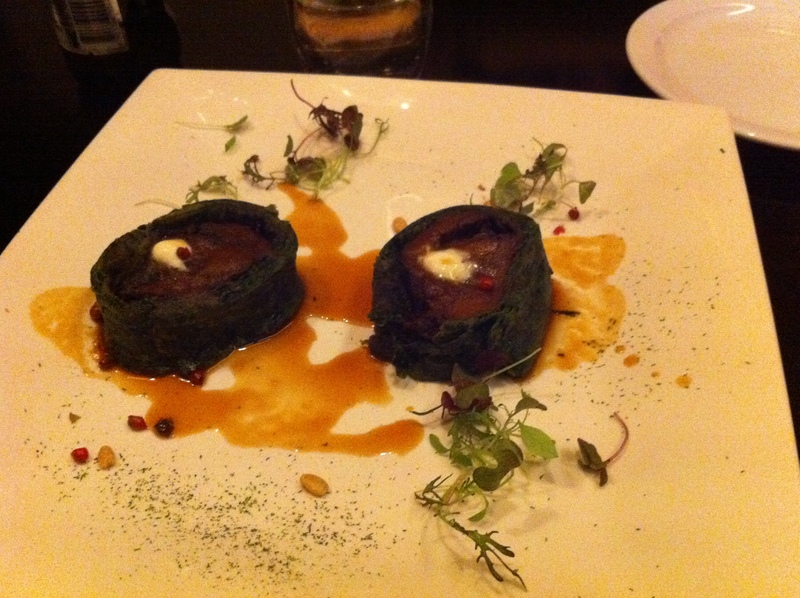 “Beef Spinach Roll” – slow cooked meat wrapped in a spinach soufflé. You had me at “slow cooked”… it was rich, it was tasty, it was delicious! This was my partners favourite dish of the evening. The next dish was the highlight of my evening: “Crab Tempura“. 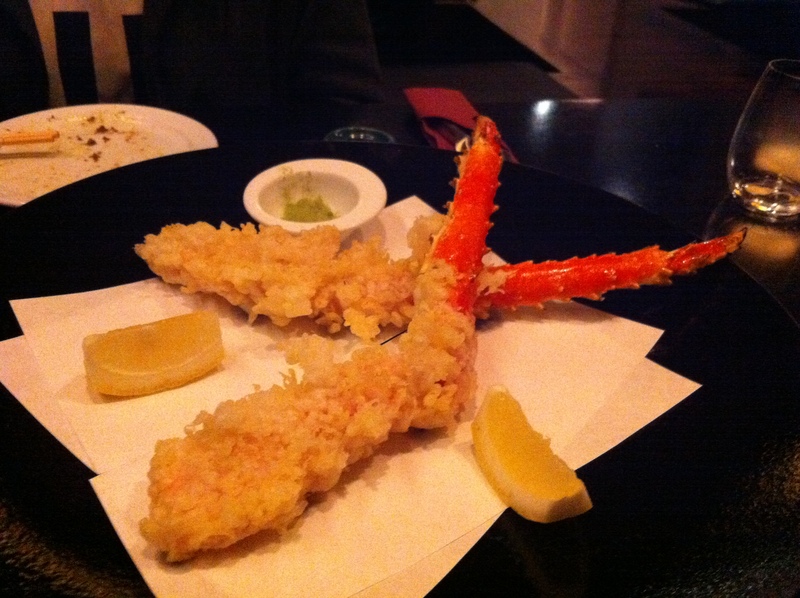 Massive crab legs in a light tempura batter served with wasabi salt. Sooo good! Warning: it does get messy with the de-shelling. At this point we got a palate cleanser – Lemon lime bitters topped with caviar. Alcoholic tasting. Strong and did the job. The next dish was snapper with noodles in a bonito soup – it was fragrant, had beautiful soft fresh noodles and a delicate broth. The burst of the roe when taking a mouthful elevated this dish to all new highs. And it was very pretty to look at. 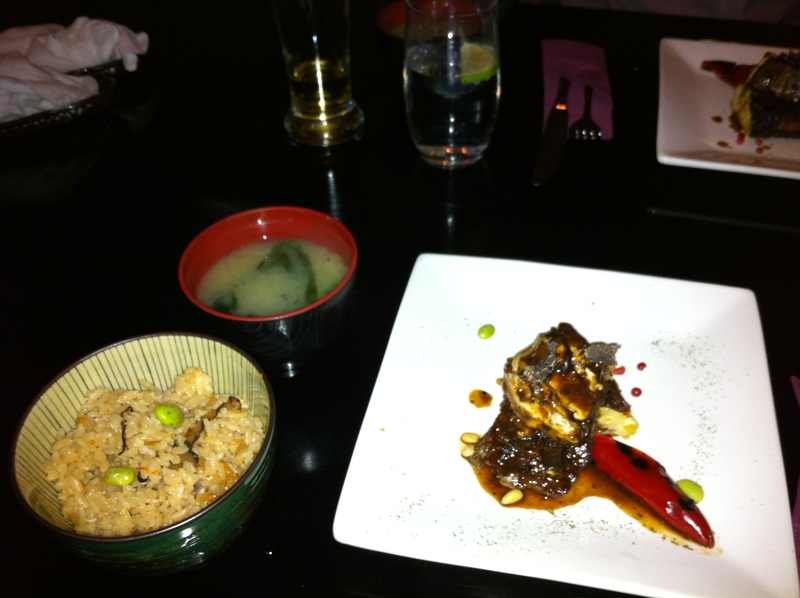 Last savoury course of the evening was “Wagyu Beef Steak“, “Mixed Rice” and “Miso Soup“. The steak was rich, and how could it not be when it has truffle with it. The rice was tasty and the miso soup was good. Felt very homely and it was a nice way to end the savoury dishes. 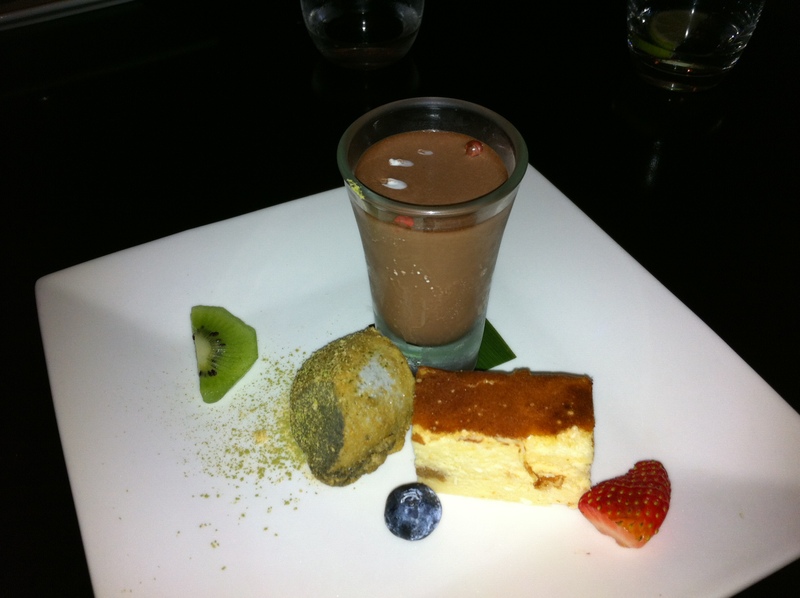 At this point of the dinner, I was bursting at the seam so luckily, dessert was a modestly sized platter aptly named “Chef’s Dessert” – there was a chocolate mousse, a green tea panna cotta and a slice of sea urchin cheese cake (it’s not as bad as it sounds!). All were good, light and most importantly, small portioned! So, all up, a fantastic experience was what I was expecting and it’s what I got. The food was as good as I’d remembered and I was a very happy camper. Previous PostThe Atlantic… great seafood cocktail!Next PostThe Commoner… not so common!